To see, touch and discover inventive design elements for hotels, resorts, cruise ships, restaurants, spas, casinos, nightclubs and other hospitality venues. 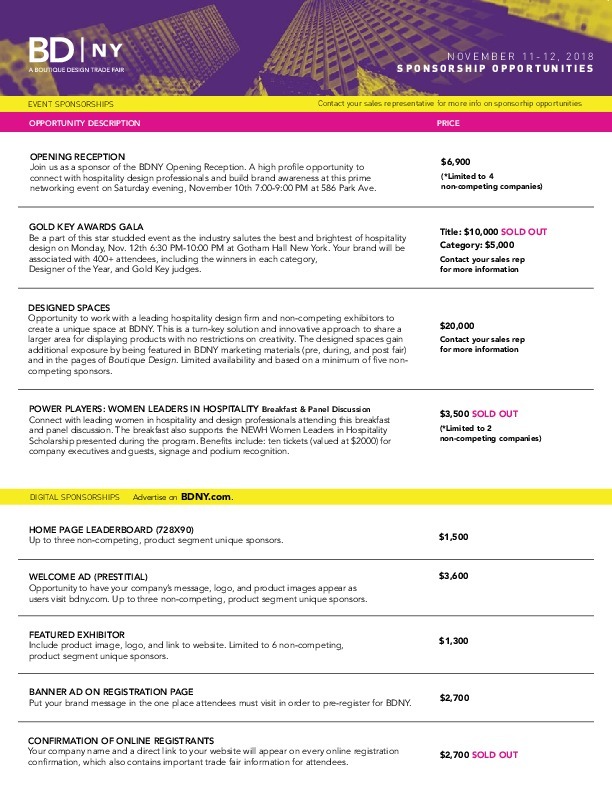 BDNY serves hospitality design professionals in the eastern United States, Europe and Canada with a multi-faceted trade fair experience focused on innovation and creativity. BD trade fairs cater to interior designers, architects, purchasing agents working on hospitality projects and hospitality firm owners and operators with design responsibility. BDNY serves the Eastern U.S. hospitality marketplace, where more than a dozen large hotel chains and hospitality businesses are based, including Choice Hotels International, Hilton Worldwide, Host Hotels & Resorts, Interstate Hotels & Resorts, Loews Hotels & Resorts, Mariott International, Starwood Hotels & Resorts Worldwide and Wyndham Worldwide. An edited selection of statement-making design product for hotels, restaurants, spas, and casinos. 600+ manufacturers and representatives of furniture, lighting, wall coverings, fabric, seating, accessories, artwork, carpet and flooring, materials, bath and spa, and tabletop.